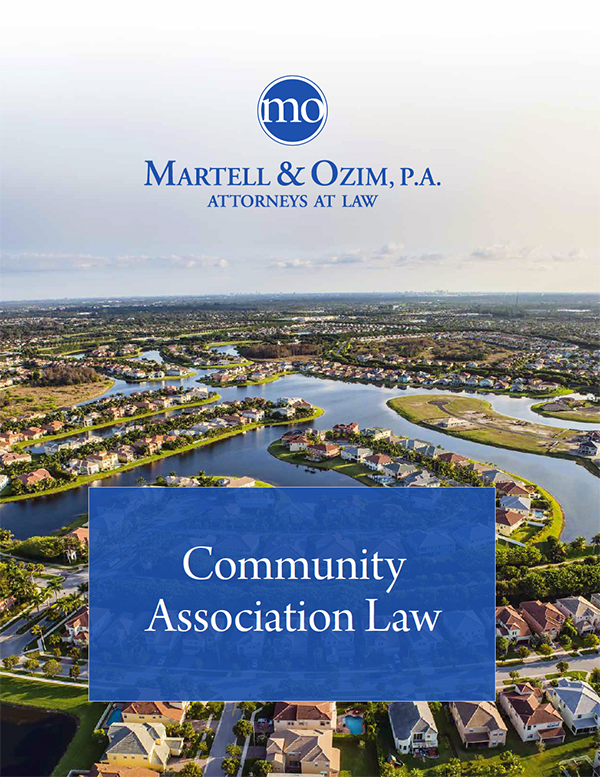 Martell & Ozim is one of a few law firms to offer budget-minded flat-rate billing on covenant enforcement matters. When you work with our Firm, you will not have to worry about the costs of pushing a matter into litigation over a covenant violation, because of unknown billable hours. The payment of delinquent assessments. The collection of rent payments from tenants. Fast and easy payoffs and estoppel certificates for short sales and property transfers. Our firm offers true withheld billing on all collection cases. It’s simple: we take the financial worry out of collection cases. There is no longer a need to worry about a problem collection case being charged at an hourly rate or a collection agency that only accepts a certain type of collection case. You can rest easy knowing that all your files can be forwarded to one firm: Martell & Ozim, P.A. Your association will know exactly how much it costs to handle the situations its dealt, such as filing a motion to force a bank to take title in a mortgage foreclosure matter or filing a proof of claim or obtain relief from an automatic stay in a bankruptcy. With flat fee billing, your association can budget its legal needs accordingly without fear of hidden costs or fees. The Advantage of Martell & Ozim, P.A. Our attorneys will review your documents and offer suggestions for amendments. Our full-service firm will assist you in recording amendments, MRTA Notices, and even revitalization of documents for declarations recorded over thirty (30) years. In addition, we will review your documents and provide you with a quote before starting any work to ensure that you know all fees upfront. Martell & Ozim, P.A. will also attend meetings and prepare notices and proxies in advance of your meeting. our brochure as a PDF.